One of the major keys to a successful suspension setup is the condition of the components. Before attempting any setting changes, check to make sure your bike’s fork and shock are in good working order. This includes replacing leaky seals, lubricating sticky linkage bushings, and changing old fork or shock oil. If your current components have more than 15,000 hard miles on them, you can bet it’s time for a rebuild. Check your steering head bearings for notchiness or tightness and replace them if needed. And most importantly, squared-off or worn out tires will mask almost any suspension change you make. The following is an outline of the major steps that will be taken to bring you bike into a good riding setup that will help you enjoy your riding experience. bikesetup.xls is an Microsoft Excel spreadsheet template which provides a way for you to follow the progressive iterations of you suspension modifications. The following sections of this article go into the dynamics of what happens when changes are made to the suspension. I state that the adjustment process is a game because of the tradeoffs that must be made. There are tradeoffs that can be given for each adjustment that you make to your bike. These tradeoff must be balanced against the gains that a specific adjustment makes to improve your suspension. The types of riding determine you expected setup. As a street rider typically expects a more compliant and plush suspension that needed to soak up the rougher roads and to be more comfortable while riding. This more relaxed stable setup will actually help over the long haul of street riding because of less rider fatigue with a stable. Track riding has different goals of pushing the bike so it provides the optimum effectives for the track. The track does not translate directly into a good street bike and vice versa. Determining the style of the rider also affects the way your setup reacts for a particular person. A smooth rider will have a different setup compared to a point and shoot style of riding. It is all relative to you and your bike. It’s important to take good notes–and lots of them, especially for the track. Along with your initial settings, you should also write down some baseline figures for things such as fork oil weight and amount, ride height, spring rates, and so on. Record any changes you make so that you can refer to them later. Also, keep notes for different types of riding street, touring, tracks–as your setup will change depending where you are and the conditions. Once you find that “magic” setup, don’t be afraid to deviate from it and experiment; you may be able to improve on what you have, and you can always go back to what you wrote down in your notes. The first step to a good setup is setting static sag. For street purposes, front sag should generally be between 30 and 35mm, and rear sag between 25 and 30mm. Don’t vary from these numbers if you’re heavier or lighter–that’s the whole idea of measuring sag while you are on the bike. An easy way to check if your shock spring rate is in the ballpark is to measure the rear “free” sag, that is, the sag without your weight on the bike. This number should be between 0 and 5mm–with the bike off its stand and on its own, you should be able to lift the rear end just slightly and top out the suspension. If your bike is topped out at rest, you need a stiffer spring, because you have got a lot of preload dialed in to achieve the correct static sag. Alternately, if your bike has a lot of free sag (you can lift the rear a bunch before it tops out), you need a softer spring. Compression damping can be initially set as follows: It is difficult to set compression damping without riding your motorcycle and feeling how its suspension works. What feels nice and plush at a standstill may turn out to be too harsh at speed, and compression damping is sometimes set by personal preference as opposed to a definite optimum. Start with the compression adjusters in the middle of their adjustment range, and take your bike for a spin. Working with the front and rear individually, soften the damping adjuster, and try your bike again over the same road. Is your handling better? Worse? The same? Try again, this time with the damping stiffer than what you started with. Continue experimenting, making adjustments accordingly. As with rebound damping, it’s always best to err on the light side with compression, and for the same reasons. Rebound damping can be initially set as follows: With the sag properly set and the bike at rest and off its stand, firmly push on the triple clamp (don’t hold on the brake or push the handlebar) or seat. When you let go, the suspension should rebound quickly to its original position–but not beyond. If it takes more than approximately one second for the suspension to return to position, less rebound damping is needed. If the fork or shock over-extends past its free sag, and then compresses again, more rebound damping is required. Street riding entails many different pavement characteristics, and the road is generally bumpy compared to a racetrack, so it’s better to err on the soft side if you are unsure. This will also give you the added benefit of a smooth ride for daily use; you can always dial in a tad more rebound when you get to your favorite road where the surface is more of a known quantity. One final check–with your bike off its stands, place your hands near the rear of the tank, and push down. A well-balanced setup will have both ends of your bike compressing and returning at approximately the same rate with this push. If the front compresses or rebounds different than the rear, attempt to match them, keeping within the parameters established individually. As with the street setup, first ensure that your bike’s suspension components are in good working order, and you have relatively new tires installed. One word of caution regarding setup and tires: Don’t get dragged into adjusting your suspension to account for tire wear over the course of a track day without taking notes. You’ll be amazed at how poorly your bike handles when you put new tires back on and keep the shagged-tire suspension settings. In general, a bike set for track use is stiffer than a streetbike, due to the increased acceleration, braking and cornering forces involved. Static sag for track bikes should be in the range of 25 to 30mm–somewhat tighter on the fork than a street setup. Similarly, compression and rebound damping should be somewhat stiffer. Avoid tightening your rebound arbitrarily; you still want the suspension to rebound within one second to its static position after pressing on the bike, but not overshoot. Ride Height can be initially set as follows: If you have a ride height adjuster on your aftermarket shock, set it to the same length as the stock unit for a start. Similarly, begin with your fork at the stock height in the triple clamps. Use the handling scenarios and the chart to determine if you need to change your bike’s attitude. Generally, for a track bike with a steering damper, you’ll want to quicken the steering as much as possible by lowering the front end or raising the rear, while still retaining stability and without sacrificing rear end traction. There are a few adjustment to your bike setup that should be done prior to making adjustments to your suspension. These adjustments could affect handling to a certain degree, and throw off getting the proper feedback. As stated earlier in this article it is important to have your bike in proper running order. Proper chain adjustment minimally affects the overall length of the rear swingarm. Although this is not significant it is a factor because of other the proper chain tension can have an impact on how the suspension reacts. This negative effect has become less pronounced with new motorcycle models because of the suspension pivot being located so close to the counter shaft. MAX EXTENSION You should check the chain tension with the bike on its wheels and preferably with someone sitting on it. You want the chain at maximum extension – or with the front sprocket, swingarm and rear sprocket all in line with each other. It probably won’t be lined up perfectly, but plonking yourself in the saddle and using your own weight (or that of a friend) is a good start. Wiggle the lower run of the chain as close as possible to the middle. You should have about 15-20mm of slack up and down. WHY BOTHER? Good question. A tight chain will place a lot of unnecessary strain on itself, the sprockets and even gearbox bearings. Keep running chains too tight and you can do a lot of expensive damage. Have it too loose and you risk the chain thrashing around and causing increased sprocket wear or, in a worst case, throwing itself off the sprockets altogether and causing a crash. A well adjusted and lubricated chain transmits the power smoothly (you can actually see the difference on a dyno), lengthens the service life, smoothes out your gear changes and makes the bike feel better to ride. If you have a conventional chain-drive bike, you’ll see the back wheel’s position can be altered with the adjusters. Whenever you tension the chain or move the wheel for any reason, you generally just line it up against the alignment marks stamped on the swingarm. If the axle is back three-and-half notches on one side, you make sure it’s back three-and-a-half on the other. Simple. The trick is to get a ball of twine, or you can do this exercise if you can somehow find two straight edges that are longer than the bike. The latter is a big call, so we’ll stick with the string method – yep, this is ye olde “stringlining”, of which you may have heard your mates speak. Usually this is easiest with the bike on the sidestand (the center stand usually gets in the way) and propped up as close as possible to vertical. A race stand is often a good option. Wrap the string around the front of the front wheel, as high as possible without snagging fairings and associated under-bike hardware when you run each end of the twine under the machine. The pics will give you the idea. This is often best done with two people, one working on each end of the bike. It is a great help to have oil cans/bricks/jackstands to hold the loose ends of the string for you while you fiddle. Getting it all lined up will be a bit of a fiddle, but simple enough assuming the bike is straight. The exact method isn’t critical, so long as you end up with a result that looks like our diagram. If you cannot get them to align, it is likely the frame isn’t straight, or the bike might even have been designed with the rear wheel offset from the front. You’ll get a lot of opinions on what tire pressure to run, but the correct tire pressure for you is not a matter of polling other rider’s opinion. Here are the basics you’ll need to decide for yourself. 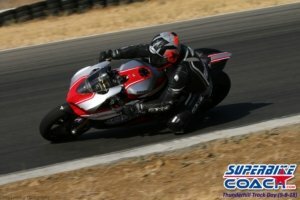 “Dennis Smith of Dunlop’s Sport Tire Services recommends an increase of two to four pounds in front tires and six to eight in the rear (sportsrider.com)”. While the most scientific means of determining if a particular pressure is the use of a pyrometer to assess whether the rubber has reached the manufacturer’s recommended temperature, charting the pressure increase of a tire after track sessions will give a good impression of how hard a tire is working. Stamped on the outside of many of your tires is a recommended tire pressure range. (At least an upper limit.) For longest tire life it is my recommendation that you strive to keep them at the higher limit of those recommendations (regardless of what your motorcycle owner’s manual might say to the contrary.) Further, this pressure should be determined while the tires are cold – meaning, have not been used for a couple of hours. Start with the bike manufacturer’s recommendation in the owners manual or under-seat sticker. This is the number they consider to be the best balance between handling, grip and tire wear. Further, if you’re running alloy wheels on poor pavement, consider adding 2 psi to the recommended tire pressure just to reduce the likelihood of pothole damage. Just as you would for a car, increase the pressure 2 psi or so for sustained high speed operation (or 2-up riding) to reduce rolling friction, increase tire life, and casing flexing. In order to get optimum handling a tire has to get to its optimum temperature, which is different for each brand of tire and different uses. Most of us don’t have the equipment needed to measure tire temperature directly so we measure it indirectly by checking tire pressure since tire pressure increases with tire temperature. Tire temperature is important to know because too much flexing of the casing of an under-inflated tire for a given riding style and road will result in overheating resulting in less than optimum grip. Over-pressurizing a tire will reduce casing flexing and prevent the tire from getting up to the optimum operating temperature and performance again suffers. First check the tire pressure when the tire is cold. Then take a 30-40 minute ride on your favorite twisty piece of road to get your tire temperature up, then measure the tire pressure immediately after stopping. If the pressure has risen less than 10% on the front or less than 20% on the rear, the rider should remove air from the tire (to increase heating affect of carcass flex). So for example, starting at a front tire pressure of 32.5 psi should bring you up to 36 psi hot. Once you obtain this pressure increase for a given rider, bike, tire, road and road temperature combination, check the tire pressure again while cold and record it for future reference. Each manufacturer is different. Each tire model is different. A tire design that runs cooler needs to run a lower pressure (2-3 psi front) to get up to optimum temperature. Remember carcass flex to generate additional heat. The rear tire runs hotter than the front tire on both road and track. So the rear tire cold-to-hot increase is greater. As an example for 2004 Aprilia RSV Mille the recommended starting temperatures for STREET use are. Please note that these numbers tend to be too high for maximum traction but in turn increase the life of the tire. Track tire pressure is a different animal altogether. With track requirements the tire pressure is a +/- game which has a goal to getting to the proper temperature and pressure to maximize grip, feel, and stability. For the track you’ll have to drop the cold tire pressures an additional 10/20%. Track operation will get tires hotter (increasing the cold-to-hot pressure range) so starting at say 32/30 psi now should bring you up to the proper opreating temperature AND create enough tire pressure to maximize contact patch AND create enought feel and stability for the track. With these goals in mind the tire should be approximatly 35/36 psi when fully heated (at optimum tire temperature). Since track riding put tremendous stresses on a “STREET” tire the tire heats up more than if it was on the street. “Race” tires will have different heat capabilities and are able to withstand the higher forces of a track better (ie cooler) than a street tire. The lower the tire pressure the more the tire deforms. The more the tire deforms, the more friction there is between the tire and the road surface. The more friction, the more heat. The more heat, the greater the opportunity the tire has to regenerate itself by shedding the ‘used’ layers of rubber (to a point). This deformation of the tire also creates a bigger contact patch at the cost of a little stability (ex rear wiggle). Different riders have differerent starting pressures. You have two riders, ‘super fast john’, and ‘average joe’ go out on the recommended 31psi pressure and ‘averages joe’s’ tires come in with the correct hot pressure (lets say 34-35 psi for example using Pirelli’s reccommended hot pressure) you can bet that because that ‘superfast John’ will be working the tire harder, spinning it more and his tire might come in reading 37psi. This would mean that to reach the target pressure of 34 psi which is the pressure and also temp that the tire works the best, ‘superfast john’ will need to take 3psi out of his tires and be starting at 28psi cold. Another good idea is to track is the number heat cycles your tires experience. Each time your TRACK tires get hot they release chemicals from deep within the rubber. As the chemicals are released the tires lose some of their grip. You can see tires that are hardly worn lose their grip due to heat cycles. Count the number of heat cycles that your tires go through and you may find a repeatable pattern that lets you know when to get that new set. Street tires a specifically designed to have many heat cycles whereas Race tires will have a fewer available heat cycles before the tire gets hard. A good indication of the tires having too many heat cycles on them is that they look fine as far as the tires not being overly worn, but the are a blue/purple color on the edge of the tire. This doesnt mean that you cant use them any more but more you just have to be ready for them to have a little less grip than they used to. Q: What is a heat cycle on racing tires? How does it affect the wear and grip of a tire? A: A “RACE” tire heat cycle is when a tire is brought up to operating temperature and run for some laps, then allowed to cool. Taking a tire through a heat cycle changes its chemistry. In most instances it stabilizes the tire compound by decreasing its heat generation. But that process also slightly increases the durometer hardness of the tire. So scrubbing the tires (one heat cycle run) will help the tires run a little cooler and wear slightly better. Successive heat cycles will continue this curing process. Eventually the tires will not provide nearly enough grip because they have gotten too hard, but they will wear like iron. Each heat cycle cures the tire rubber more and makes in harder. Keep good records on each of your tires so you know how much use – and how many heat cycles – each of your tires has. Heat Cycles: Heating your tires for practice and then keeping the warmers on between practice sessions saves Heat Cycles (the # of times a tire gets hot and then cools) which age your tires (the tire goes “off” meaning the best grip is gone). If the correct operating temp for your tire is 180′ F (just a number i pulled out of the air), and with a brand new tire it takes 2 laps to warm you tires up to operating temperature, then the next day ( i am spacing it out longer than a session) it may take 3 laps, then 4 laps etc. at a certain temperature a tire’s compounds have a chemical reaction which makes the tire sticky and gives it more grip, after each heat cycle the tire hardens and then it takes longer to get to that temperature. Each heat cycle hardens the tire (as explained before), if you cool the tire very slowly it is less likely to harden as much as if you pulled off the track, parked the bike on a stand and let the ambient temp cool the tires. this is why a lot of trackday riders/racers will put their tire warmers on but not plug them in, the insulated blanket will slow down the cooling effect. chickenhawk tire warmers also have a low temp setting where you can almost have the warmers on the low setting all day. When you are accounting for your riding style and the way different days, streets, tracks can be accounted for. All bikes will have different characteristics which means my starting riding temperature is different than yours. Additionally with the colder months of the year tire pressures and the effect of temperature can greatly affect the overall pressure. Time and outside temperature effect the pressure within your tires. It is NORMAL for a tire to lose about 1 pound per square inch (psi) per month. Outside temperatures affect your tire pressure far more profoundly, however. A tire’s pressure can change by 1 psi for every 10 degrees Fahrenheit of temperature change. As temperature goes, so goes pressure. For example, if a tire is found to have 38 psi on an 80-degree mid-summer day, it could lose enough air to have an inflation pressure of 26 psi on a 20-degree day six months later. This represents a loss of 6 psi over six months and an additional loss of 6 psi due to the 60 degree temperature reduction. At 26 psi, your tire is severely under inflated and dangerous! What is being illustrated here is that you MUST check your tire pressure on a regular basis (about once a week is reasonable) and to be particularly aware of it on cold days. As an additional note of caution: New tires tend to be very slippery when ridden for the first time. It is recommended that an easy scrubbing in over 20-50 miles of riding. This will allow the tire to get rid of the mold catylist used for removing the tire and provide an initial heating which releases a layer of rubber to provide optimum traction. A sportbike should normally not use its full suspension stroke, although on some circuit one or two big bumps or hollows can cause the suspension to bottom. Also landing of front wheel after wheelies can cause excessive use of the front fork stroke. If suspension bottoms in big bump or hollow, it should not automatically mean that the suspension should be set more hard. However, if suspension bottoms at the place were the maximum grip is essential the tire cannot create the best traction, because it also has to perform as spring. Adjusting the setting is necessary. During every riding session the suspension stroke should be carefully checked. When tire grip and lap times improve, the suspension has a harder job. So, setting must be set harder. On the opposite, when it starts raining tire grip and lap times go down, in that case a softer setting should be applied. Preload adjuster (3)- Is the larger nut on the top of the front forks (not to be confused with the smaller rebound damping). Movement of the Forks within the Triple Clamps, can be substituted for the preload adjuster. Compression Damping (2) – the one on the bottom near the axle is compression damping. Preload adjuster (3&4) – Is adjusted by using a C-Spanner or the appropriate wrench/spanner. Compression Damping (2) – is the adjuster on the reservoir usually a knob or a screw. Rebound Damping (1) is the adjuster knob on the shaft . Spring Preload – Release the ring nut (4) by means of the appropriate spanner. Adjust (B) through the adjusting ring nut (3) After adjusting, tighten the ring nut (4). Rebound Damping – Work the ring nut (1) to set shock absorber rebound damping. Compression Damping – Adjustments are made by turning the knob or, by turning the screw (2) depending on types of models. Slightly loosen the lock nut (5) . Turn the adjuster (6) to change the overall length of the rear suspension shock absorber length (A) (distance between centers). Contrary to the fork’s controls, rear rebound damping is changed from the bottom of the shock. The fork rebound adjuster, like all the damping controls, screws in for firmer and out for softer. The compression damping adjuster usually resides on the lower portion of the fork. No matter what shock or fork you have, they all require proper adjustment to work to their maximum potential. Suspension tuning isn’t rocket science, and if you follow step-by-step procedures you can make remarkable improvements in your bike’s handling characteristics. The first step to setting up any bike is to set the spring sag and determine if you have the correct-rate springs. Spring sag is the amount the springs compress between fully topped out and fully loaded with the rider on board in riding position. It is also referred to as static ride height or static sag. If you’ve ever measured sag before, you may have noticed that if you check it three or four times, you can get three or four times, you can get three or four different numbers without changed anything. We’ll tell you why this occurs and how to handle it. Step 1: Extend the suspension completely and measure. By getting the wheel off the ground. It helps to have a few friends around. On bikes with sidestands the bike can usually be carefully rocked up on the stand to unload the suspension. Most race stands will not work because the suspension will still be loaded by resting on the swingarm rather than the wheel. Measure the distance from the axle vertically to some point on the chassis (metric figures are easiest and more precise; Mark this reference point because you’ll need to refer to it again. This measurement is L1. If the measurement is not exactly vertical the sag numbers will be inaccurate (too low). Step 2: Downward Compression suspension with Rider on the bike and measure. Take the bike off the stand and put the rider on board in riding position. Have a third person balance the bike from the front. If accuracy is important to you, you must take friction of the linkage into account. This is where our procedure is different: We take two additional measurements. First, push down on the rear end about 25mm (1″) and let it extend very slowly. Where it stops, measure the distance between the axle and the mark on chassis again. If there were no drag in the linkage the bike would come up a little further. It’s important that you do not bounce! This measurement is L2. Step 3: Upward Compression of suspension with Rider on the bike and measure. Have your assistant lift up on the rear of the bike about 25mm and let it down very slowly. Where it stops, measure it. If there were no drag it would drop a little further. Remember, don’t bounce! This measurement it L3. Step 4: Do the number crunch: The spring sag is in the middle of these two measurements. In fact, if there were no drag in the linkage, L2 and L3 would be the same. To get the actual sag figure you find the midpoint by averaging the two numbers and subtracting them from the fully extended measurement L1: static spring sag = L1 -[(L2 + L3) / 2]. You might notice the Sag Master measuring tool (available from Race Tech) in the pictures. It’s a special tool made to assist you in measuring sag by allowing you to read sag directly without subtracting. It can also be used as a standard tape measure. Measuring front-end sag is very similar to the rear. However, it’ much more critical to take seal drag into account on the front end because it is more pronounced. Step 1: Extend the suspension completely and measure. Extend the fork completely by getting the bike off the ground and measure from the wiper (the dust seal atop the slider) to the bottom of the triple clamp (or lower fork casting on inverted forks; Figure 2). This measurement is L1. Step 2: Downward Compression suspension with Rider on the bike and measure. Take the bike off the sidestand, and put the rider on board in riding position. Get and assistant to balance the bike from the rear, then push down on the front end and let it extend very slowly. Step 3: Upward Compression of suspension with Rider on the bike and measure. Lift up on the front end and let it drop very slowly. Where it stops, measure again. Don’t bounce. This measurement is L3. Once again, L2 and L3 are different due to stiction or drag in the seals and bushings, which is particularly high for telescopic front ends. Step 4: Do the number crunch: Just as with the front, halfway between L2 and L3 is where the sag would be with no drag or stiction. Therefore L2 and L3 must be averaged and subtracted from L1 to calculate true spring sag: static spring sag = L1 – [l2 + l3) / 2]. Step 5: Adjust the preload. To adjust sag use the preload adjusters, if available, or vary the length of the preload spaces inside the fork. It’s important to stress that there is no magic number. If you like the feel of the bike with less or more sag than these guidelines, great. Your personal sag and front-to-rear sag bias will depend on chassis geometry, track or road conditions, tire selection and rider weight and riding preference. Here are some basic symptoms of suspension damping problems that you might find affecting your bike. Remember these are extreme examples; your symptoms may be more subtle. You may also have to find an acceptable compromise on either end of the adjustment spectrum. It all depends on how the bike’s handling “feels” to you. The fork offers a supremely plush ride, especially when riding straight up. When the pace picks up, however, the feeling of control is lost. The fork feels mushy, and traction “feel” is poor. After hitting bumps at speed, the front tire tends to chatter or bounce. When flicking the bike into a corner at speed, the front tire begins to chatter and lose traction. This translates into an unstable feel at the clip-ons. As speed increases and steering inputs become more aggressive, a lack of control begins to appear. Chassis attitude and pitch become a real problem, with the front end refusing to stabilize after the bike is counter steered hard into a turn. – The front can feel unstable. The motorcycle wallows and tends to run wide exiting the turn causing fading traction and loss of control. Insufficient rebound. Increase rebound “gradually” until control and traction are optimized and chatter is gone. The ride is quite harsh–just the opposite of the plush feel of too little rebound. Rough pavement makes the fork feel as if it’s locking up with stiction and harshness. Under hard acceleration exiting bumpy corners, the front end feels like it wants to “wiggle” or “tankslap.” The tire feels as if it isn’t staying in contact with the pavement when on the gas. The harsh, unforgiving ride makes the bike hard to control when riding through dips and rolling bumps at speed. The suspension’s reluctance to maintain tire traction through these sections erodes rider confidence. – It will give poor grip of the front tire. – It feels like the front wheels will tuck under in corners. Front-end dives severely, sometimes bottoming out over heavy bumps or during aggressive breaking. Insufficient compression. Increase “gradually” until control and traction are optimized. Front end dive while on the brakes becomes excessive. The rear end of the motorcycle wants to “come around” when using the front brakes aggressively. The front suspension “bottoms out” with a solid hit under heavy braking and after hitting bumps. The front end has a mushy and semi-vague feeling–similar to lack of rebound damping. – Strong diving of the front. The ride is overly harsh, especially at the point when bumps and ripples are contacted by the front wheel. Bumps and ripples are felt directly; the initial “hit” is routed through the chassis instantly, with big bumps bouncing the tire off the pavement. The bike’s ride height is effected negatively–the front end winds up riding too high in the corners. Brake dive is reduced drastically, though the chassis is upset significantly by bumps encountered during braking. – Good result during braking. – Feels harsh over the bumps. Front end rides high through the corners, causing the bike to steer wide. It should maintain the pre-determined sag, which will allow the steering geometry to remain constant. Decrease compression “gradually” until bike neither bottoms or rides high. Front end chatters or shakes entering turns. This is due to incorrect oil height and/or too much low speed compression damping. Bumps and ripples are felt directly in the triple clamps and through the chassis. This causes the front wheel to bounce over bumps. Decrease compression “gradually” until control is regained. The ride is plush at cruising speeds, but as the pace increases, the chassis begins to wallow and weave through bumpy corners. This causes poor traction over bumps under hard acceleration; the rear tire starts to chatter due to a lack of wheel control. There is excessive chassis pitch through large bumps and dips at speed and the rear end rebounds too quickly, upsetting the chassis with a pogo-stick action. – The bike feels unstable. Insufficient rebound: Increase rebound until wallowing and weaving disappears and control and traction are optimized. This creates an uneven ride. The rear suspension compliance is poor and the “feel” is vague. Traction is poor over bumps during hard acceleration (due to lack of suspension compliance). The bike wants to run wide in corners since the rear end is “packing down”; this forces a nose-high chassis attitude, which slows down steering. The rear end wants to hop and skip when the throttle is chopped during aggressive corner entries. – The rear “jumps” on the bumps instead of following the surface. – The rear “jutters” under braking. – It holds the rear down with the result that the bike will understeer! Rear end will pack in, forcing the bike wide in corners, due to rear squat. It will slow steering because front end is riding high. Too much rebound. Decrease rebound “gradually” until harsh ride is gone and traction is regained. Decrease rebound to keep rear end from packing. – The rear wheel start to bump sideways under acceleration out of the corner. – The bike will squad too much (rear is too low), that will cause the front to loose grip.. Insufficient compression. Increase compression “gradually until traction and control is optimized and/or excessive rear end squat is gone. The ride is harsh, though not quite as bad as too much rebound; the faster you go, the worse it gets, however. Harshness hurts rear tire traction over bumps, especially during deceleration. There’s little rear end “squat” under acceleration. Medium to large bumps are felt directly through the chassis; when hit at speed, the rear end kicks up. – The rear wheel to slide under acceleration . – It can give a harsh ride over bumps. Decrease compression until harshness is gone. Decrease compression until sliding stops and traction is regained. – Gives easy turning into corners. – Makes the rear feel harsh. – Create poor rear wheel traction. – Gives good traction in acceleration. – Creates understeer in entry of corner. – Makes too much suspension travel which will make it difficult to “flick” the bike from one side to the other in a chicane. – Will give a light feeling in the front. – It feels harsh in the corners. – Can cause front to tuck under. – Bad under braking (diving). First see manual. The modern front fork of cartridge type is very sensitive for oil Level changes, because of the small air volume Air inside the front fork works as a spring. The different level of oil effects the spring ratio from the middle of the stroke and has a very strong effect at the end of the stroke. When the oil level is raised: The air spring in the later half stage of travel is stronger, and thus the front forks harder. When the oil level is lowered: The air spring in the later half stage of travel is lessened, and thus the front forks are softer. The oil level works most effectively at the end of the fork travel. The factories plan on designing a bike that works moderately well for a large section of riders and usages. To accomplish this as economically as possible, manufacturers install valving with very small venturis. These are then matched to a very basic shim stack which creates a damping curve for the given suspension component. At slower speeds this design can work moderately well, but at higher speeds, when the suspension must react more quickly, the suspension will not flow enough oil, and will experience hydraulic lock. With hydraulic lock, the fork and/or shock cannot dampen correctly and handling suffers. The solution is to re-valve the active components to gain a proper damping curve. It does not matter what components you have, (Ohlins, Fox, KYB, Showa), matching them to your intended use and weight will vastly improve their action. Furthermore, if you can achieve the damping curve that is needed, it does not matter what brand name is on the component. Often with stock components, when you turn the adjusters full in or out, you do not notice a difference. In part, this is due to the fact that the manufacturer has put the damping curve in an area outside of your ideal range. Also, because the valves have such small venturis, the adjuster change makes very little difference. After re-valving, the adjusters will be brought into play, and when you make an adjustment, you will be able to notice that it affects the way the way the fork or shock performs. Trying to figure out a handling problem can be tricky. It’s hard enough dealing with the intricacies of spring preload, rebound damping, etc., but when a definite problem forces you to back off the throttle and take notice, trying to determine the root cause of a handling difficulty can be downright baffling. Is it the front or rear causing it? And how do I know if rebound or compression damping adjustments will help? In this section, we’ve come up with some of the most common handling complaints that afflict the average rider. Some of these problems occur entering the corner, some of them happen in mid-corner, and others can even cause difficulty exiting a corner. Take a close look at the various problem scenarios we’ve listed and see if one of them sounds similar to a dilemma you’ve been struggling with. Then try our suggested solutions to see if they make an improvement. Remember take it one step at a time, take a test ride after each change, and take notes on whether that change made a difference. Problem: A tankslapping bike feels unstable, especially when entering turns. The bars seem to “twitch” excessively whenever a midcorner bump is encountered. The bars often whip back and forth violently several times (or more) when A tankslapping bike is accelerating aggressively over bumps while coming out of a turn–in other words, a “tankslapper.” The bike steers very easily, although a lack of traction is sometimes noticeable in the rear whenever he tries to accelerate at moderate lean angles. The bike also seems to have a dropped-down, “nose low, rear-end-high” attitude while riding. Solution: The biggest distinguishing factor in this case is the “nose-low/rear-end-high” chassis attitude feeling. . This not only hinders traction at the rear, but also affects the steering geometry (steeper rake/less trail) and can cause the instability problems. As long as the bike is suspension static sag levels set correctly, the first step is to try less rear spring preload and/or more front preload, to the point just before they begin to affect handling negatively; You should remember to adjust his rebound damping if necessary (in fact, he should check to see if decreasing the front rebound damping in small increments helps; the forks may be too stiff, hindering traction). If only partially successful, a more drastic step would be changing chassis ride height; this would involve raising the front end by dropping the fork tubes in the triple clamps (if there’s enough material protruding above the top clamp, to ensure front fork structural integrity), and/or dropping the rear by shortening the rear shock (if possible). Note: We’ve also seen a tankslapping tendency produced by too much rearward weight bias. The bike might try to be working the opposite of the preceding paragraph solution, or check out the understeer/no front traction problem scenario for more suggestions. Problem: Although the bike may have a very smooth ride while riding over potholes and such in the city, once out in the canyons, the bike seems to “float” over the pavement like a luxury car, with little or no pavement feedback. When he starts to ride aggressively, the bike rocks back and forth excessively, especially during brake/throttle transitions, and the “floating” feeling becomes even more pronounced. Hard cornering makes the bike feel loose, almost as if it has a hinge in the middle. Mike’s tires might begin to chatter midcorner when encountering bumps and accelerating over those bumps causes his bike to wallow or weave. Cause: The problem here is generally not enough rebound damping. Solution: The ride is smooth and supple at low speeds, but higher speeds generate greater amounts of energy that can’t be dissipated with the little damping available. As a general rule of thumb, if either end is pushed down firmly and quickly by hand, the suspension should return in a smooth, controlled manner without “rebounding” once or twice before settling down. Try stiffening up the rebound damping in small steps, and remember to do the front and rear separately, not simultaneously; that way he can readily see if one or the other makes a difference. If the rebound damping is cranked up to the maximum and the bike still feels soft and wallowy, you may need to rebuild the suspension components. Problem: When Richard gets on the brakes aggressively while approaching a corner, the bike’s rear end begins to swap side-to-side, and feels as if it wants to pivot around the front. Cause: The cause is too much front end weight transfer under braking. The front end is compressing so low that the bike’s weight tries to pivot around the steering head, causing the side-to-side movement. Solution: The quickest solutions here are to increase the front fork spring preload and/or raise the front ride height by dropping the fork tubes in the triple clamps, or decrease the rear ride height by shortening the shock (if possible). Try increasing the fork spring preload first, and progressing in small increments until the handling begins to be negatively affected (remember to watch the rebound damping when increasing the spring preload). If that doesn’t work, try the ride height modifications; watch for adverse handling reactions in other areas when doing this as ride height changes drastically affect how the bike corners. Other solutions to try–although less effective–are to increase the compression damping in the forks (if possible), or to decrease rebound damping in the rear (to allow the rear tire to follow the pavement quicker). Again, watch for adverse handling reactions in other riding situations when test riding. Problem: The bike is uncomfortable and he feels every little bump in the road. He doesn’t have any confidence because his bike feels nervous and twitchy, especially over bumpy sections where it doesn’t absorb the bumps, and his tires lose grip easily. Diving into corners during track days, the bike is unstable and jumps around over every little bump and crack in the tarmac. Cause: The rough ride is most likely due to a generally too-stiff setup–with too much compression and rebound damping. Solution: First off, the rebound adjusters as outlined in the setup section, and back the compression adjusters out to no more than the middle of their range. This will give a starting point to work from, and get rebound damping in the ballpark. Dialing in the rebound more accurately can be accomplished by riding the bike over a rough section of pavement; the suspension should not pack down (too stiff), nor should the bike be wallowy like a Cadillac (too soft). Riding the bike repeatedly over the same road after making small changes to the damping adjusters is a good way to distinguish between the characteristics and determine a good setting. Once the rebound is set properly, the compression damping can be fine-tuned according to the setup section. Once again, make small changes between test sessions over the same road to feel and compare the different settings. Problem: When braking hard approaching a corner, the front fork bottoms out severely, especially over bumps. However, the fork action and overall bike handling is fine everywhere else. Cause: The problem here is the ride height is set up correctly for his riding style, but the fork action is obviously too soft whenever weight is transferred to the front (as when hard braking). Solution: The from previously stiffened up the fork spring preload, and while it helped with the bottoming problem, it unfortunately made his bike’s chassis attitude too front-end-high, adversely affecting handling. The cure here would be to raise the fork tubes in the triple clamps (starting in increments of 4mm), which lowers the front end; you could then increase fork spring preload without causing the ride height problems mentioned previously. Care should be taken to ensure that the front wheel/fender isn’t getting too close to bottoming out on the lower triple clamp or radiator when lowering the front or raising the fork tubes. If the preload adjuster becomes maxed out during testing and dial-in, a set of heavier rate springs or a larger preload spacer (inside the fork) may be necessary. Problem: The bike’s steering feels super heavy at low speeds, and once he gets his bike turning by using lots of muscle, it practically falls into corners. Solution: if the bike has a steering damper mounted, it may be adjusted too tight. Suspension-wise, heavy steering is a typical result of having rear ride height set too low, raking out the chassis like a chopper. If the same troubles occur after trying this bike with the steering damper backed off, checking his tire and adjusting his steering head bearings, the problem is most likely in his bike’s chassis attitude. Front and rear sag should be checked and set correctly, followed by another ride to check for any changes in handling. If there is little or no change, gradually change the geometry by either raising the fork tubes in the triple clamps or–and has a rear ride-height adjuster–raising the rear of his bike. When dropping the front end of a bike by adjusting fork height, it’s a good idea to keep an eye on clearance between the front tire and radiator, and also–on a conventional fork–to ensure the sliders don’t bottom out on the lower triple clamp. Problem: Trouble with the bike’s front end, especially while exiting turns, where the front tire loses traction and pushes to the point where it’s washed out. The steering is a bit heavy, and on uneven sections of pavement the front tire skips over bumps and threatens to fold if pushed too hard. Cause: The trouble is probably due to a combination of sag and ride height settings that leaves his bike riding high up front. Solution: Having a front tire skip over bumps on the exit of a turn is a sign that the fork is topping out–without enough sack to allow the suspension to sink into depressions in the road. Check the bike’s front and rear sag settings to ensure correct spring preload. With the preload set, take the bike for a spin to determine if there’s any change in its behavior. If the problems persist, backing off the front preload will drop the front of the bike a bit, quickening the steering and letting the wheel track over bumps more effectively. If, however, the fork starts to bottom under braking with the preload backed off, the fork tubes can be raised in the triple clamps to sharpen the steering while keeping the original preload setting. Every activity has its own language. Learning a new skill sometimes feels as if it requires scaling a linguistic learning curve that makes surmounting Mt. Everest seem like a day hike. To the uninitiated–not that any Sport Rider reader could be accused of this–the language of motorcyclists can seem just as daunting. So, to make sure we’re all standing on top of the same hill, peruse the terminology below to help speed yourself along to suspension enlightenment. Bottoming (also called bottoming out)–when a suspension component reaches the end of its travel under compression. Bottoming is the opposite of topping out. Cartridge Fork–a sophisticated type of fork that forces oil through bending shims mounted to the face of damping pistons contained within the fork body. The primary advantage of cartridge forks is they are less progressive than damping rod forks. The shims allow damping control at very low suspension speeds while high speeds deflect the shims more–causing less high-speed damping than fixed orifice damping rods. The resulting ride is firmer with less dive under braking while simultaneously lessening the amount of force square-edged bumps transfer to the chassis. Damping General is viscous friction. It is caused when liquids are forced through some type of restriction. The key thing to remember about damping is that it is dependent on fluid movement. This means a shock creates no damping force unless there’s movement-movement of the damper unit in compression or rebound as opposed to bike movement. Damping cares about vertical wheel velocity, not bike speed. Damping Rod Fork–a simple type of fork that utilizes a tube with holes in it to create compression and rebound damping, delivering an extremely progressive damping curve. The faster the wheel moves vertically, the more oil that is shoved through the holes. Typically, damping rod forks have very little low-speed damping and a great deal of high-speed damping. The ride is characterized by excessive fork dive under braking and hydraulic lock when encountering square-edged bumps. Any change to the damping rod system, such as changing the size of the holes or altering the oil viscosity, affects the entire speed range. High-Speed Damping–damping to control fast vertical movements of suspension components caused by road characteristics such as square-edged bumps. High-Speed damping is independent of motorcycle speed. Fork Oil Level–the level of oil within the fork as measured when fully compressed without the spring installed. It is used in tuning the amount of air contained inside the fork. Since compressing air makes it act as a spring, raising the oil level leaves less room for air, resulting in a rising rate throughout the fork’s travel. Reducing the oil level reduces the force at the bottom, giving a more linear rate. Free Sag–the amount the bike settles under its own weight. Both streetbikes and race bikes require 0 to 5mm of free sag on the rear. The bike should not top out hard. Packing–a phenomenon caused by excessive rebound damping. When a series of bumps, such as ripples, are encountered the suspension does not rebound completely between bumps and compresses (packs) further down on each successive bump. This can drastically change steering geometry if packing occurs on only one end of the motorcycle. Preload–the distance a spring is compressed from its free length as it’s installed with the suspension fully extended. Preload Adjuster–a method of adjusting suspension components’ preload externally. These can be ramped or threaded. Preload Spacer–material used to adjust a fork’s preload internally. Typically, thin-walled aluminum or PVC tubing is used. Rake–the steering neck angle (not the fork angle) relative to vertical, which varies with changes in ride height. For example, the rake angle decreases when the front end compresses or is lowered. Changes in tire diameter can also influence rake by altering the ride height. Ride Height–suspension adjustments (raising or lowering the fork or lengthening or shortening the shock) to alter the chassis attitude of the motorcycle. Shock preload can be altered with a spanner wrench or with the time honored hammer and punch. Spring–a mechanical device, usually in the form of a coil, that stores energy. When compressed, more energy is stored. Springs are position sensitive, caring only how much they have been compressed, not how quickly (as with damping). Suspension Fluid–used inside a shock absorber to create damping when forced through orifices or valving. The fluid is also used for lubrication and should be incompressible. Topping Out–occurs when the suspension extends to its limit. A shock with a spring of the proper rate mounted should have just enough force to top out without a rider on board. Trail–the horizontal distance between the front end’s point of rotation (i.e. where a line drawn through the steering head would intersect the ground) and the contact patch of the tire. Since trail is dependent on rake, it is a variable dimension that changes proportionally with the variation of rake during suspension action. For example, trail drops off dramatically when the bike reaches full dive under braking, giving a rider more leverage to initiate steering inputs. Triple Clamp Offset–the distance from the center of the fork tubes to the steering stem center. The greater the offset, the smaller the trail dimension. .Unsprung Weight–the weight of every part of the motorcycle that is between the road and suspension (i.e. wheels, brakes, suspension components below the springs, etc.). Valving–the mechanical hardware that creates damping. Valving is a combination of check valves, holes, ports, shims, springs, etc.